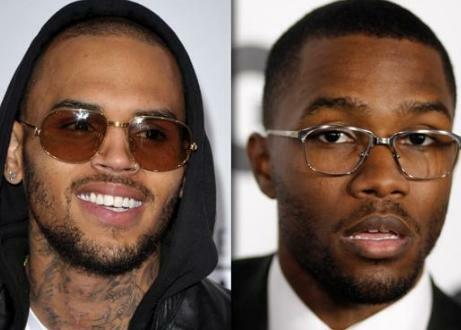 So how was Frank Ocean threatened by Chris Brown? A look at the recently-released police report from the fight incident involving the two hip hop stars sheds light on exactly what went down. A report from TMZ.com on on Feb. 5 shows that Ocean told police he was called a “f**got” while involved in the altercation with Breezy. Moments later, Brown allegedly threatened to shoot the Grammy-nominated singer as well. The incident occurred last week over a parking space at a recording studio. Apparently, Ocean tried to tell Brown he took his parking space at the studio. Brown offered a handshake during the discussion, but Ocean refused to shake his hand. After that, Ocean was reportedly punched in the face by brown, and then pushed into a corner by two of Brown’s entourage members, who attempted to kick him. Ocean noted that he believes someone yelled “f**got” at him during the altercation but is not sure who it was that said it. He also said Brown’s shooting threat was “We can bust on you too!” Apparently, this all lasted just two or three minutes in the parking lot brawl with Ocean suffering a few cuts: one on his right index finger and another on his left temple. He went to a hospital later on. While it’s been reported that Ocean didn’t want to press charges, it has been noted in the police reported he “wanted to see Brown in jail.” Seems like a lot of people do these days. Frank Ocean is a Grammy-nominated singer who has appeared on the hip hop album “Watch the Throne” with Kanye West and Jay-Z, as well as other rap projects. Brown has done his share of guest appearances on rap tracks as well, and has also been nominated for multiple awards during his career. He is currently working on his new studio album called “Carpe Diem,” while Brown awaits this weekend’s Grammy Awards to see how many statues he racks up.